This blog breaks down all four double header of games played in the South Region, which are the games that appear in the lower right corner of brackets. It shows the top 10 players on the floor for each of these double headers, and gives details on which factors give advantages to which teams. UNC wins the entire national championshipo based on the Las Vegas odds, and Kentucky wins the whole title based on the most NBA talent on the court. 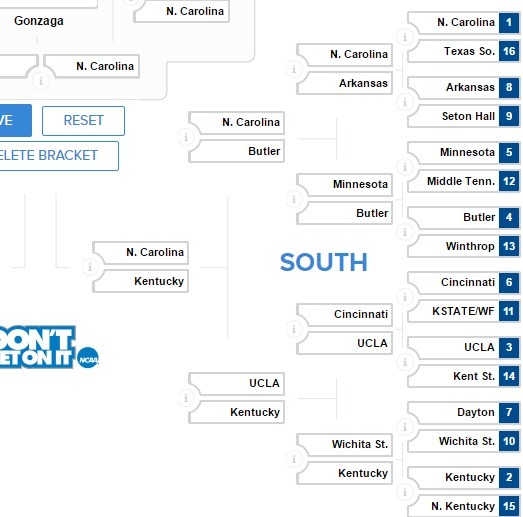 UCLA wins the Region based on the top 3 players, and Wichita State based on specific matchups. Everyone in this group is red hot, with UNC letting one slip away against Duke, Arkansas improving from 59th to 38th, and Seton Hall moving up falling just short of making it six straight wins with a defeat of Villanova until Josh Hart scored a game-winning on an offensive rebound. Health: UNC’s Theo Pinson makes them even better, but missing games kept him out of the top 100. Possible “style/home” edge upset: UNC’s weakness is they do give up a lot of steals (179th at protecting the ball) which could be a real problem against Seton Hall (68th in steals) but a bigger problem against Arkansas (37th in steals). Still, UNC’s huge home crowd for a game played just down the road in South Carolina should pull them through even if they get a close game. If it comes down to the top trio, Middle Tennessee dominates with three of the top four players. Possible “style/home” edge upset: Middle Tennessee could get some steals (23rd best) against Minnesota (93rd best at protecting the ball). Winthrop should get up some 3-pointers (49th) against a Butler team that is only 224th in forcing opponents to shoot 2s instead of 3s, but Butler has huge home advantage in a Big East arena they play in every year. 79, Wesley Iwundu #25, Kansas St.
114, Jimmy Hall #35, Kent St.
133, Dean Wade #32, Kansas St. Potential coaching match up of great former players in Danny Manning (coaching Wake Forest) and Steve Alford (UCLA). Kent State improved from 171st to 141st with a great end of season run. Possible “style/home” edge upset: Cincinnati (19th in steals) could wreak havoc on Kansas State (258th in protecting the ball) or even Wake Forest (140th). Wake Forest could make up some of that ground with 3-pointers (30th in the country, while Cincy’s defense is only 197th at forcing 2-point shots). UCLA has the big home court advantage and as the 6th best three-point shooting team should have their way with any of the other four teams from behind the arc except perhaps Kansas State (83rd best at forcing 2-point shots). 98, Markis McDuffie #32, Wichita St.
108, Landry Shamet #11, Wichita St.
207, Conner Frankamp #33, Wichita St.
Wichita has won 15 straight to move from 28th to 8th. Kentucky rolled through the SEC championship. Possible “style/home” edge upset: Both Dayton and Wichita State allow a lot of 3-point attempts (283rd and 267th respectively at forcing opponents to take 2’s). The problem for Dayton is that Wichita shoots 3-pointers even better than they do (3rd in the nation vs. 29th). Unfortunately for the winner of that game, Kentucky is one of the best at preventing both three-point attempts (51st) and steals (6th).